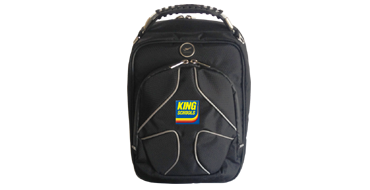 King Schools Custom Flight Bag—Be True to Your School! You'll impress both your passengers and friends with your King Schools custom flight bag. This professional-quality flight bag designed by MyGoFlight features an organizer, room for an iPad, small laptop computer, a headset and more! There is a front pocket for pens, flashlights, documents, cellphone, keys, business and credit cards. Rear Compartment - Padded iPad/tablet pocket. Accordion style pocket provides easy access to the headset or overnight items. See through zippered mesh pockets. Weight: 1 lb, 8 oz. return it within 30 days for a prompt, friendly refund.